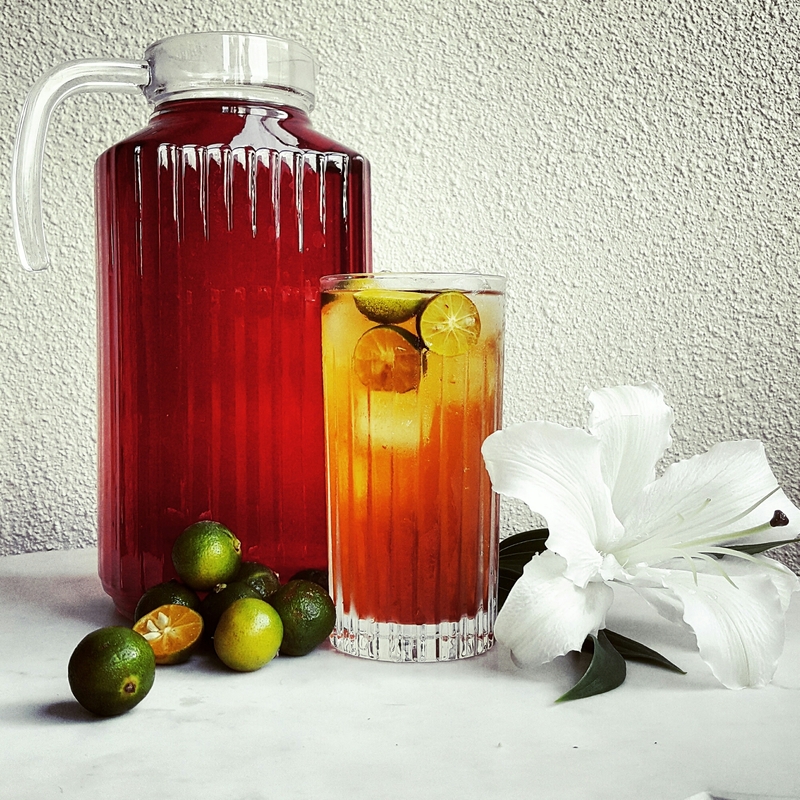 In the Philippines, iced tea is a staple. Much as we in North America enjoy our iced tea with lemon, in the Philippines, calamansi is the citrus of choice. The calamansi fruit tastes like a cross between a lime and a mandarin orange. It works perfectly in iced tea, and this recipe will fast become your favourite (non-alcoholic) drink. Many people purchase a prepared calamansi iced tea powder. I prefer to brew my own tea and flavour it with sugar and calamansi juice. If you are unfamiliar with calamansi juice, fret not. You can buy it in most North American grocery stores. You probably won’t find it in the juice aisle. Nor will you find anything bigger than a small can. I usually see it in the ‘Asian Food’ section, beside cans of lychee, mangosteen, and aloe juice. Some brands to look out for are; Gina, and Phillipine Brand. If you happen to find fresh calamansi fruit at an Asian grocery store, substitute 1/2 cup fresh squeezed calamansi juice for canned juice in the recipe below. Just add a touch more sugar. Clean and set aside a juice jug large enough to accommodate 3.5 L of water. Bring 3L of water to a boil. Add tea bags to cleaned juice jug. Pour boiling water over tea bags. Remove tea bags after 5 minutes. Do not allow tea bags to stay in longer than 5 minutes, unless you like your tea with a strong tannin flavour. After removing the tea bags, add the sugar and mix with a long handled spoon until sugar is dissolved. Add calamansi juice. Stir and refrigerate until iced tea is nice and cold. Serve and enjoy. Tags: calamansi, calamantea, iced tea. Bookmark the permalink.